Dr. Maria De Jesus brings to AU a wealth of research and teaching experiences in the area of health inequalities, a critical area of focus in interstate and transnational relations. Her research examines the role of cross-cultural health communication as a mechanism to eliminate health inequalities. As globalization and migration have created a demographic imperative for the development of effective health communication strategies and technologies, her scholarship responds to the world-wide interest in the health of members of immigrant and diaspora communities and pointedly connects health to the key dimensions of race, ethnicity, gender, class, culture, religion, immigration, migration, communication, and inequalities. Her overarching goal is to generate knowledge particularly on underrepresented populations that can then inform health practice and policy. Prior to her appointment at AU, she was a post-doctoral fellow at the Harvard School of Public Health and the Dana-Farber Cancer Institute's Center for Community-based Research, where she served as co-investigator on several NIH-funded cancer disparities research studies. She also taught at Boston University and Boston College. 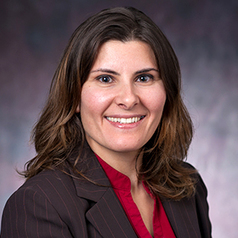 At AU, she was awarded a grant from the Department of Health and Human Services to examine the application of technology in disseminating m-Health educational messages and to reduce disparities by addressing socio-economic, literacy, access, and psycho-social barriers among underserved Latina populations. In addition, she was awarded a grant from the District of Columbia Developmental Center for AIDS Research to conduct a community-based study that examines and compares the culture-specific HIV and HIV testing perceptions and communication norms of East African-born and African American women in Washington, DC, who are disproportionately affected by HIV.